“There is something wrong when developers would rather build empty spaces to prop up the wealthy rather than building the affordable housing that 99% of New Yorkers need. “Every New Yorkers should have a right to light and air, to see the sky, and should not be condemned to live in the shadows of the wealthy. “Buildings on stilts looked cool on the Jetsons, but the reality is more like Blade Runner, where the poor must live in the shadows below the wealthy above. "None of this would have been possible without expert and advocates at Friends of the Upper East Side Historic Districts and Landmark West! "Thank you to Mayor de Blasio and City Planning Chair Lago for ensuring new buildings are not empty voids but built for people. The proposed zoning text amendment seeks to address the issue within residential towers in high density residential districts by limiting the amount of mechanical void space that can be excluded from zoning floor area. New York, NY – The 349 miles of scaffolding covering New York City has begun collapsing on the residents it is meant to protect. Under the current laws, scaffolding is self-certified for safety by the contractors who install it, without any independent inspection by the city’s Department of Buildings. Under new legislation Int. 1353 authored by Council Member Ben Kallos and sponsored by Council Members Adams, Chin and Public Housing Chair Alicka Ampry-Samuel, scaffolding that has been up for a year or more will be required to undergo safety inspections by the Buildings Department at least once every three months at the expense of the building owner. Two of the council members who are co-sponsoring the bill have had scaffolding collapses in their districts, some resulting in serious injuries. "1.1 million New Yorkers voted for campaign finance reform in New York City politics and it is time to get big money out of Albany. "Whether your top issue is education, transit, environment, or public safety, a precondition to winning is a public campaign finance system that forces politicians to work for voters over the interest of big money. Council Member Ben Kallos introduced Int. 1130 in 2016 to reform New York City’s campaign finance system. After Kallos testified at Mayor de Blasio’s Charter Revision Commission in favor of campaign reforms, those reforms were adopted as Ballot Question 1. Kallos successfully advocated for Question 1 in the NYCCFB’s Voter Guide, actively participated in the Democracy Yes coalition, and authored opinion editorials in favor of the reforms in City and State and Medium. Kallos then authored Local Law 1 of 2019 extending the new campaign finance reforms of Ballot Question 1 to the special election for public advocate and to special elections that follow. 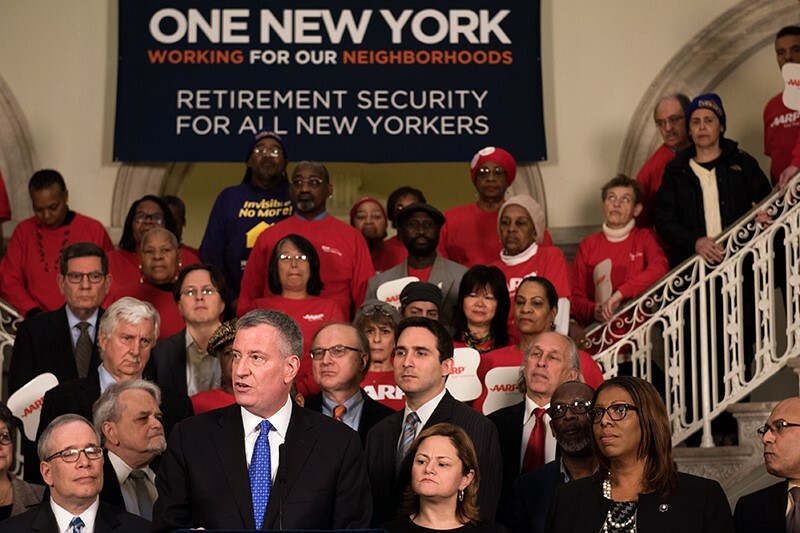 New York, NY – Today, Mayor Bill de Blasio announced his intention to move forward with “Retirement Security for All,” previously announced on February 25, 2016. The plan met with uncertainty following the passage of House Joint Resolutions 66 and 67 by Rep. Walberg (R-MI) and Rep. Rooney (R-FL) on March 30, 2017 and signature by Trump on April 13, 2017, to roll back regulations permitting States and Municipalities to offer retirement savings plans. New York State Attorney General and then Public Advocate Letitia James authored legislation now re-introduced by City Council Member Ben Kallos and Civil Service and Labor Committee Chair I. Daneek Miller, Int. 888 & Int. 901, that would allow every private sector worker in New York City to save pre-tax for retirement even if their employer did not offer a 401K. New York, NY – Affordable housing and economic development projects receiving city subsidies would be required to pay workers a prevailing wage and provide training in the classroom and on the job through apprenticeship coupled with transparency, under legislation introduced by Council Member Ben Kallos. 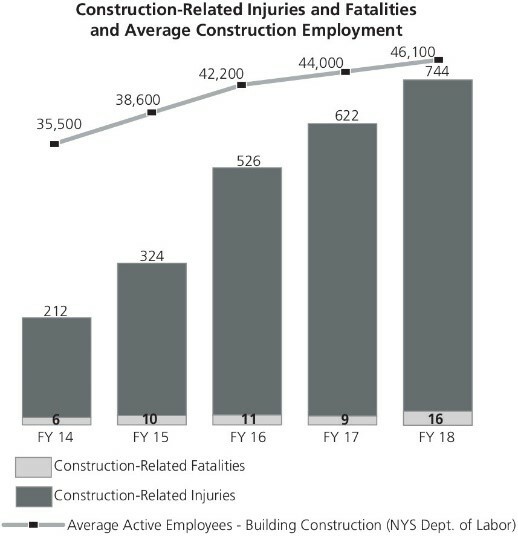 Construction-related injuries and deaths continued to rise for the fifth straight year to 744 injuries and 16 deaths in fiscal year 2018, approximately triple the 212 injuries and 6 deaths in fiscal year 2014 according to the Mayor’s Management Report, as reported by City and State. Over the past fiscal year, when incidents further increased by 20%, Local Law 78 of 2017 authored by Council Member Ben Kallos was implemented forcing developers to report of construction-related injuries and fatalities with new minimum fines of $2,500 for failure to report. The Local Law 78 reports have been available on a monthly basis since June 2018 from the DOB. Council to Have Increased Oversight of HPD’s Affordable Housing Programs as a Result of Legislation Introduced by Planning, Dispositions and Concessions Chair Kallos. New York, NY – Real Estate developers will be required to disclose contacts within government agencies who have the potential to influence projects currently being considered for city subsidy. Developers will also have to disclose to the City Council their ownership interests and Minority Women Business Enterprise (MWBE) status, as well as their efforts to hire locally, prior to seeking permission to build on city land or obtain millions in city subsidies. Introduction 1323 of 2019, authored by Council Member Ben Kallos, continues his push for transparency in government especially at the Department of Housing, Preservation and Development (HPD). This legislation forces HPD to provide the City Council with a copy of its 37-page “Compliance Package” prior to hearings so that the Council has an opportunity to review and look into contacts that may be facilitating deals for developers. New York, NY – Today, the City Council passed legislation aimed at preventing the annual back to school “nightmares.” At the start of every school year, New York City's students are stuck on buses for hours, leaving parents worrying as to where their children are. Council Member Ben Kallos introduced two bills passing the Council today as part of the STOP Act, that would give parents an opportunity prior to the school year beginning to review and challenge routes and require bus companies to test routes with dry runs. The second bill co-prime sponsored by Council Member Chaim Deutsch, requires the Office of Pupil Transportation (OPT) to install GPS devices on buses so parents know where their children are. Upper East Side, NY – The Upper East Side will be getting 640 new public school seats thanks to advocacy by Council Member Ben Kallos. The seats are planned as part of an estimated $324.64 million investment to fund a total of 2,794 new public school seats for School District 2, which includes the Upper East Side, along with Tribeca and the Village (912 seats) as well as Chelsea and Midtown West (1,242 seats). The seats are outlined in the School Construction Authority and Department of Education’s proposed fiscal years 2020 – 2024 five-year capital plan. Since taking office in January of 2014, Council Member Ben Kallos has been a zealous advocate for new school seats for the Upper East Side. Over 1,400 new public school prekindergarten through eighth-grade seats have been planned, funded or built on the Upper East Side, Roosevelt Island and Midtown East since 2014, with this announcement, following direct advocacy by Council Member Kallos. Council Member Kallos has expressed his concerns to Mayor Bill de Blasio, the Department of Education, and in particular to the School Construction Authority (SCA) at hearings dating back to 2015. Kallos has consistently questioned the administration about the Upper East Side’s need for more school seats in at least half a dozen separate hearings including: May 28, 2015, March 16, 2016, May 16, 2016, March 8, 2017, March 21, 2017, March 26, 2018, April 18, 2018, and May 22, 2018. This summer, Kallos brought to the attention to the SCA that his district was at 102% elementary utilization and that with new construction, new seats were necessary to help prevent any further overcrowding. Phase Il of the Second Avenue Subway ("SAS") is critical to the development and future health of my community. We are writing to ask that you lead a tour of the Phase Il extension with myself, other local elected officials, and community stakeholders in East Harlem to update us on your goals and immediate objectives of this critical project. Your leadership during Phase I of the SAS project was instrumental in its completion. It is even more important now given the opening of Phase I that we harness the momentum so that we can complete this equally important Phase Il. Thank you to New York State Comptroller Thomas DiNapoli, New York City Comptroller Scott Stringer, former State Comptroller Carl McCall, and former City Comptroller William Thompson for unanimously using legislative pay raises to bring long overdue ethics reforms to the state legislature. The commission did the right thing and now the legislature must accept their decision by giving up stipends known as “lulus” used by legislative leaders as rewards and punishments and limiting outside income to 15% or $19,500 with an outright ban on legal practice. I am humbled that the New York Times once again praised the City Council for reforms I authored that were passed by our body as a model. I join the New York Daily News in calling for the Assembly and Senate to adopt additional rules reforms. I supported Council Members Jumaane Williams, Brad Lander, and David Greenfield as a Council Member-elect and eventually co-sponsored rules reforms in 2014 to giving all members equal staff budgets, equal discretionary funding modified transparent for poverty levels, empower chairs to call hearings and direct committee staff, and to force hearings on legislation with the support of a supermajority of the City Council. The ethics and rules reforms we won have led to a more democratic legislature that has empowered the people of this great city to win the reforms they need. New York, NY - As the special election for Public Advocate in New York City draws near to be called in January, with a cascade of special, primary and general elections to follow, Council Member Kallos has authored legislation applying the new campaign finance reforms overwhelmingly adopted by 80% of the voters who voted on ballot question 1 on November 6 to the special election now and municipal elections that follow through 2021. In addition, the legislation would also lower the threshold for citywide candidates to qualify for public matching funds. The legislation has been introduced pre-considered T2018-3404 and already scheduled for a hearing in the Committee on Governmental Operations at 10AM on December 12, 2018. Lowered contribution limits from $2,550 citywide to $1,000, $1,975 for borough president to $750, and from $1,425 for city council to $500. Increased public matching of every small dollar of $175 and under with 6 public tax dollars to 8 public dollars and small dollars of $250 and under for citywide with 8 public dollars. Increased public grant from 55% to 75% of the spending limit. Unlike, question 1, lowered contribution limits and increased matching would be retroactively applied to candidates that select this option. In addition to applying ballot question 1 to the special election the legislation goes further by lowering the minimum funds raised threshold to qualify for a public grant by half, just as other limits are halved. The threshold for Mayor is halved from $250,000 to $125,000 and for Public Advocate and Comptroller from $125,000 to $62,500. Only the first $250 of an individual New York City resident’s contribution is applied toward meeting dollar amount threshold. Participating candidates would still need to collect the same number of contributions of 1,000 for Mayor and 500 for Public Advocate and Comptroller. New York, NY – Sidewalks and streets on the Upper East Side are about to get cleaner with the attention of a dedicated Wildcat Service crew after $85,000 in funding from the NYC Cleanup Initiative allocated by Council Member Ben Kallos. A three-person crew will focus its efforts on four-day a week sweeping of sidewalks and bike islands, cleaning gutters and drains of blockages, and removing liter from tree pits. The new initiative funding follows ongoing investment by Kallos and a commitment to cleaning up the Upper East Side that has included securing twice a day basket pickup and buying a 322 new large covered trash cans for every corner in the district, limiting overfill and spillover that became litter. 79th, 86th, and 96th between East End and Lexington Avenues. New York, NY — Following an expansion of the Upper East Side’s safe streets network, coupled with an increase in education, safety equipment, and enforcement, bike safety from 30th to 97th streets on Manhattan’s East Side continues to improve as a result of a program led by Council Members Ben Kallos and Keith Powers. Since the program’s launch by Council Member Kallos in 2014 there has been a trend toward fewer injuries for pedestrians, cyclists and motorist injured in collisions. The trend also shows fewer collisions involving cyclists. This year, the program included a new bike safety officer and the expansion of protected bike lanes. In October of this year, the 19th Precinct lead by Commanding Officer Deputy Inspector Kathleen Walsh and Executive Officer Captain William Gallagher established a “Bike Safety Officer” assigning Officer Tuohey to patrol Upper East Side bike lanes and street, ensuring safe passage for pedestrians and cyclists alike. Improving the bike lane on Second Avenue between 68th and 59th streets from shared to partially parking protected planned for 2019. Providing a pedestrian and bike crossing for the 59th Street Queensboro Bridge planned for 2019. Doubling bike lanes from just First Avenue and the 90th & 91st Street pair to include Second Avenue, 70th & 71st Street and 77th & 78th Streets in 2017. Leading pedestrian intervals along York Avenue to give pedestrians a chance to cross before vehicles get the green light in 2016. “Safety neckdowns” have extended the curb and islands have been added at dangerous intersections throughout the Upper East Side, so pedestrians have less distance to cross.